Forum Index > Historical Arms Talk > How narrow the eye-slit of the visor? Posted: Sun 07 Aug, 2011 3:52 pm Post subject: How narrow the eye-slit of the visor? A nallower slit has good protection. How nallow the eye-slit of the visor? Is it 10mm(0.39inch) or less? How many mm(inch) is the MOST NALLOW(thinnest) width of the slit? I think you meant "narrow", and that's good question indeed. Don't think that many museums provide that accurate measurements. All I know is that there's great variety here too, I've seen original helmets with pretty wide visors, and the ones with their visors pretty minimal for any view trough them indeed. You covered the pros and cons nicely. 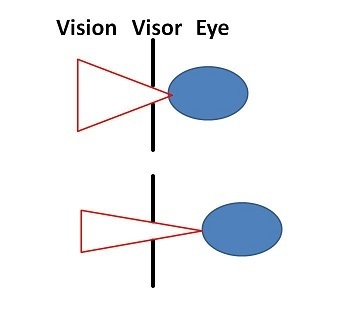 Better vision versus better protection. I imagine each warrior would have a personal preference as to what was best for them. It was probably a matter of taste, and they could be wide or narrow depending. However, even if there is a sizable range, I would like to see actual measurements quantifying what that average variation was. I would expect the opinion and real artifact dimensions to be dependent on the situation. 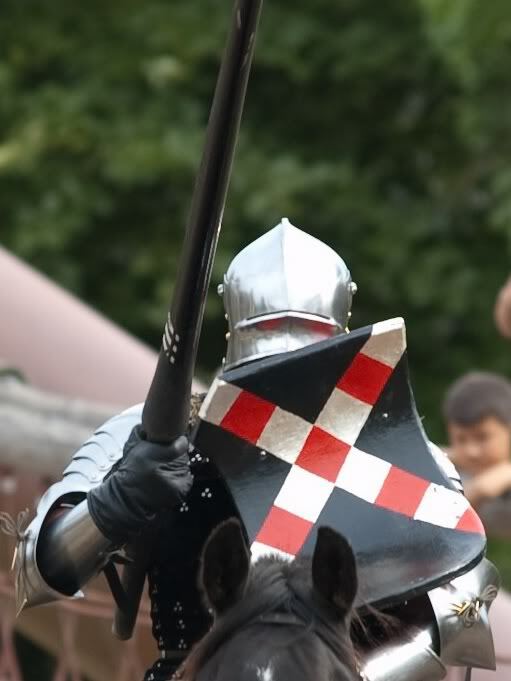 Joust or other specialized circumstances could favor narrow focus and small eye slots. Foraging and skirmishes may favor more open bar type visors, or even open faced helms such as Norman or Barbute. I realize that your examples and interest are later period, but the principle stated in 12th-13th century era may still have been applicable. At least in 13th century era, a couple of the few inventories I ever saw mentioning armor indicated several different types of helms being in the owners' estates. 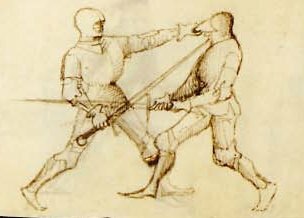 A treatise, i think by Ralph Niger, mentioned in one of my Francis Gies books actually stated as much that closed helms were too troublesome and suffocating for use other than tourney. I think a Occularia of 1cm wide would be as wide as I'd go for a single "slot", but perhaps 5mm or lest if there are multiple holes. One thing to consider..just how far away from the eyes the actual vision slit is. For example, I'd imagine a 1 cm slit in , say a close Helm, would give a much better field of view than a similar sized slot in a Great Helm. As for jousting. I seem to recall reading that some of the later " Frog Faced" ( ??) helms had very wide fields of view when galloping down the lists, but ZERO visibility at moment of impact as the riders were meant to straighten in the saddles slightly, lifting the head and effectively blocking out the visor slits so there was no chance of lance fragments entering the slits. I`d like to illustrate Ralph`s point by a selfmade graphics. If you just got an average helmet out of some armoury it would probably shrink your vision more than a helmet custom-made for you. Well, did anyone actually ever fight with such close slit helmet? I thought that after the initial charge, the visor would be raised (or great helm dropped) to allow better vision for combat. What do reenactors have to say regarding vision? I don't mean to knock any of this off topic - that would be really good for my first post - but I believe in adding a little more discussion on the same principle. How in the world were knights able to fight with such limited vision? reguargless of how wide or how narrow these slits are, they still limit vision. And vision on the field of war I would tend to believe is quite leathel. but also so would be 10 people trying to stick you in the face with something sharp. I watched a documentary a while back and I don't really remember the name of it (but it was from the history channel), and I think the historian mentioned was David Nicole that pushed a theroy that knights faught with their visors up, and maybe the visor was down only in an initial charge. Art work from the Talhoffer plates would lend some support to that theroy. Its not as awful as most people assume. Once you have trained in a fully visored helmet, whatever the style - you become accustomed to the limited vision. Yes, there are limitations on your field of view so keeping in motion is helpful to see what is around you. Also our brains have a neat trick of filling in the missing visual elements as part of the view is covered and other parts open up. You can train yourself to do this with safety goggles taped over to resemble a visor occularia. We at AEMMA use more restrictive occularia than most surviving helm visors have. You simply get used to it with more helmet time. Frankly its a lot easier to learn than how to breath properly behind that visor! But that's another topic. Exactly my experience as well. The trick is not to look at the visor slits once it is down, but to look at the enemy you are fighting. When I try to recollect a certain fight later on, I don't remember the visor at all, only my opponent and how we fought. I use a round-snouted hounskull bascinet. There are some breathing holes on the right side, and there is some vision through them, too. Also, I have some holes above and beneath the ocularia which enhance the sight considerably. From what I have personally seen and measured, average eye slot thickness for late 15th century helms was about 5-6 mm. 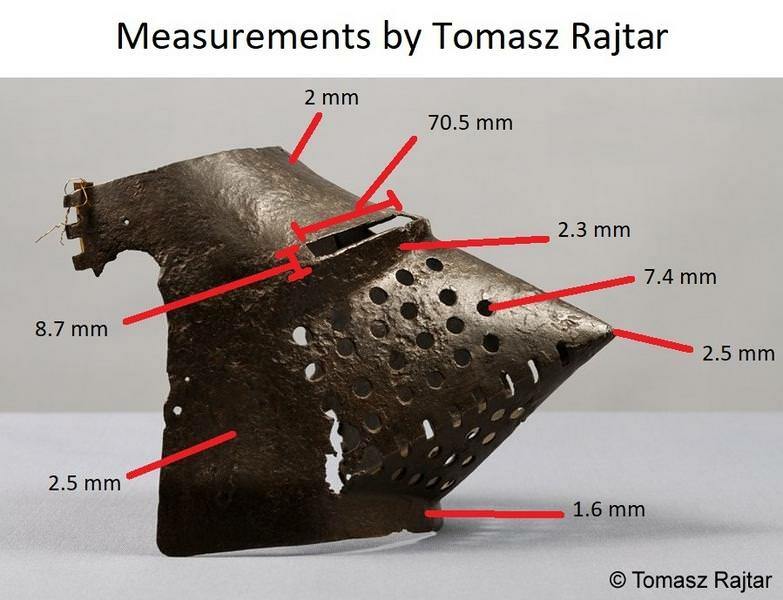 Thin eye slots, like in your Maximillian helm photo, were in the sub 4mm range, and thicker eye slots like in the reproduction armet photo should have been around 8 mm, but not much larger. Maximillian close helm visor slits is thinner than a 5mm CD/DVD case! 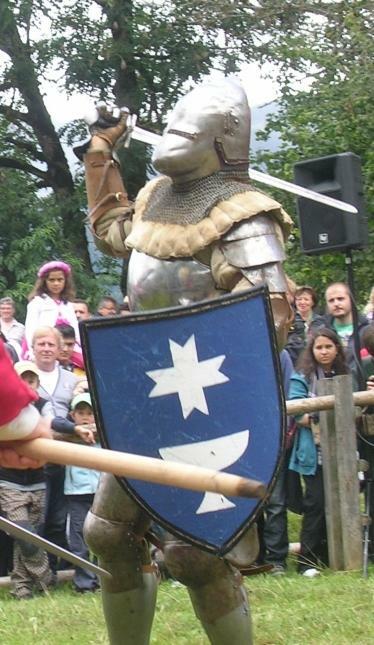 Not a reenactor but from a early 15th Century manual we have Fiore telling us, in his armoured sword section, that if you can not trust your opponent in the face because of his visor lift it. This tells me that people sometimes wear visors when the fought hand to hand on foot. 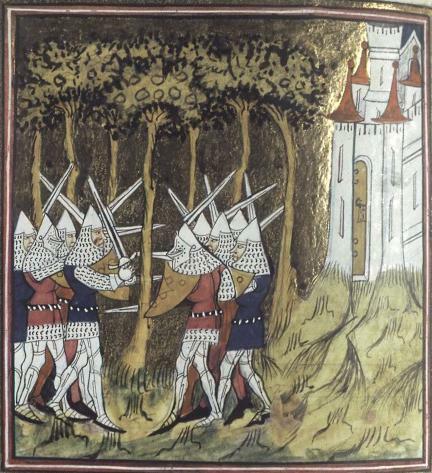 There are also lots of images of men fighting in hundsgugel bascinet. Posted: Wed 07 Sep, 2011 4:28 pm Post subject: How narrow the eye slt? .Measured two maximilian armets, both had split (two slots), one helmet slit is 5/16" the second is 1/4". An Italian armet (continuous) slit is 3/8". 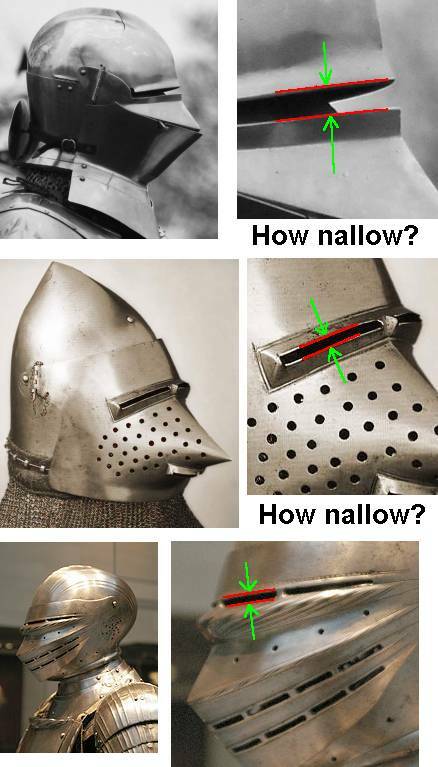 Two sallets, one English (?) with small visor is1/2', the other German (without visor) is 1/2'. A Greenwich close helmet had a more complex opening(s). With split (two slots) tapered from 5/16' at center to 3/16" at the outer edges, measurements were vertical, but following the slope of the visor the actual opening is about 1/2" at center. Material from the opening is turned inward at the bottom edge forming a "shelf" to protect the wearer form downward weapons thrusts and missiles. The helmet owner referred to it as an "arrow shelf". Curiously these two slits formed a chevon, sloping downward and outward at about 5-7 degrees and gives a far better view than a horizontal slot. Discovered this when I was able to try on the helmet, used two stocking caps as padding. Measured two maximilian armets, both had split (two slots), one helmet slit is 5/16" the second is 1/4". 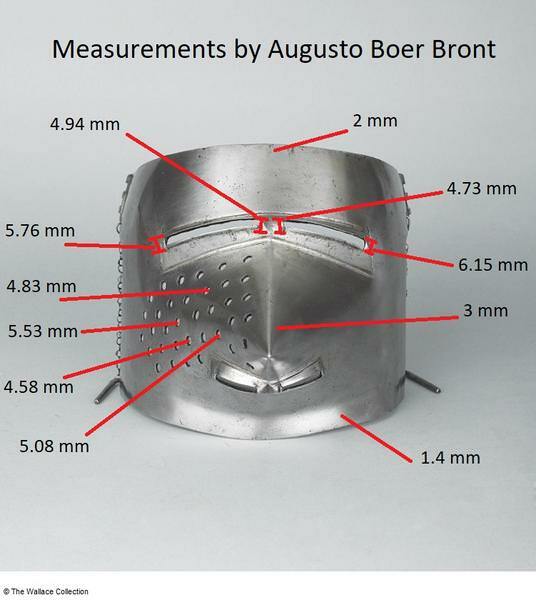 An Italian armet (continuous) slit is 3/8". Two sallets, one English (?) with small visor is1/2', the other German (without visor) is 1/2'. but... Where are these numerical source from? My visor slot's about 5 mm and it gives adequate vision for a charge on horseback. For heavy fighting on foot it's comfortable to have it closed during dangerous maneuvers, like when forcing through enemy lines, but I prefer to fight with an open visor, due to having the opponents much closer to me. Posted: Wed 14 Sep, 2011 1:52 pm Post subject: How narrow the eyeslit? Made the measurements in two different private collections during a recent trip. Am certain all helmets were "for real", but with some of the forgeries it is sometimes difficult to tell. Off course measuring ocularium is usually not on my to do list, but am always eager to visit other collectors and happened to remember your post. I remember seeing this tread years ago, and hopefully I can add something to the discussion now. From the bascinet held at the Wallace Collection, London. And a visor held in the Polish Army Museum, Warsaw.